Last Updated: January 29, 2018 | Subscribe to our weekly newsletter! It takes a combination of chemicals to keep your pool clean and swimmable. You need something to sanitize your water, something to balance it, something to keep algae from forming, possibly something to control metal content, and maybe a couple more, depending on your location and pool type. But sometimes just adding a chemical isn’t enough. You also need to ensure that chemical can do its job properly by adding a sort of “assistant” chemical. One of those chemicals is cyanuric acid, also known as pool stabilizer. Its sole function is to stabilize the chlorine in your pool so the sanitizer lasts longer, thereby keeping your water clean longer. But what exactly is it, and why do you need it to help chlorine do its job? Before you start pouring things into your pool just because we told you to, you’d probably like to know what exactly this stuff is, right? Let’s take you back to high school chemistry for a quick second, except this time no pop quizzes—we promise. Cyanuric acid If you click this link and make a purchase, we earn a commission at no additional cost to you. is a type of chemical compound called a triazine, which simply means it contains three nitrogen atoms and three carbon atoms. Other triazines include polyurethane resins, herbicides, and disinfectants. Cyanuric acid is a precursor to those, meaning what you put in your pool is not the same substance you use to kill dandelions in your driveway. 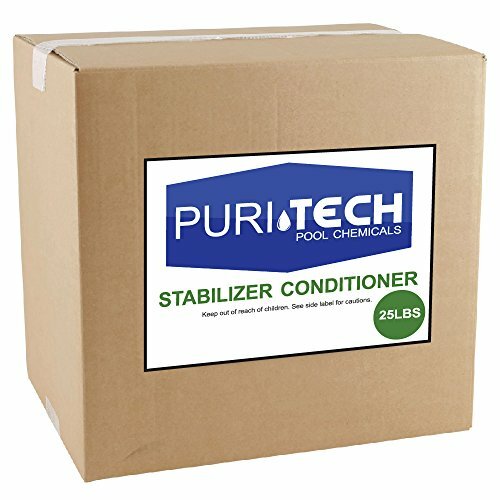 Cyanuric acid is sometimes abbreviated as CYA, and it’s also called pool stabilizer, pool conditioner, or chlorine stabilizer. It’s sold in liquid or granule form. You can even get it mixed in with chlorine tablets or sticks, called trichlor, and in chlorine shock, called dichlor. 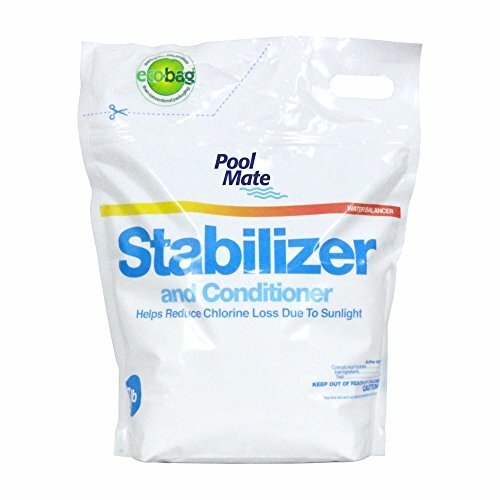 These combination products are referred to as stabilized chlorine because the stabilizer is mixed right in with the sanitizer, saving you the trouble of measuring and adding them separately. CYA plays an important role in your pool, but before you can fully appreciate what it does, you need to know a little bit about how the sun affects chlorine. Your pool contains three types of chlorine: total, free, and combined. Free chlorine is the amount of sanitizer available to clean your pool water. It’s present when you add chlorine If you click this link and make a purchase, we earn a commission at no additional cost to you. directly to your water, or when it’s created by a salt water chlorinator. Whichever way it gets there, it’s necessary for safe, sanitary swimming. Combined chlorine is the amount of sanitizer that’s been used up killing bacteria and other nasty stuff in your water. Total chlorine is, as the name suggests, the total amount of sanitizer in your pool—the sum of free and combined chlorine. When you put chlorine into your pool water, it transforms into sodium hypochlorite ions. When ultraviolet (UV) rays from the sun hit those ions, they break apart. The chlorine part evaporates, leaving very little free chlorine in your pool water. In fact, within 17 minutes of exposure to UV rays, half of your free chlorine will be gone. In addition, for chlorine to destroy contaminants for the same amount of time without CYA, you would need as much as eight times more chlorine than if you added CYA. Right there, adding cyanuric acid to your pool can save you a lot of money. Unless you want to take out a second mortgage to pay for truckloads of chlorine to add to your pool every hour, add some cyanuric acid If you click this link and make a purchase, we earn a commission at no additional cost to you. to help you get a little more life out of your sanitizer. Pools with very low or no CYA will have significant chlorine demand. This is because unstabilized chlorine is destroyed by UV rays very quickly. This leaves your pool vulnerable to contaminants unless you continually add more chlorine. Instead of making chlorine upkeep your full-time job, add cyanuric acid instead. Once the chlorine in your pool water has transformed into sodium hypochlorite ions, the CYA binds to those ions, preventing them from breaking apart when exposed to UV rays. This is how it preserves your free chlorine and allows it to destroy bacteria three to five times longer than it would without cyanuric acid. That extra time is especially important because at the same time CYA stabilizes chlorine, the bond between cyanuric acid and sodium hypochlorite ions also hinders chlorine a bit. Chlorine’s ability to effectively sanitize is called oxidation reduction potential (ORP). This figure, measured in millivolts, is important because it shows you how well your free chlorine is working. Cyanuric acid reduces chlorine’s ORP, regardless of how much of it you put in your pool. But if you add too much CYA, or allow cyanuric acid levels to get too high, you’ll completely obliterate the chlorine’s effectiveness, meaning you’ll have wasted money on two chemicals and still have a dirty pool. You need your chlorine to stick around, but you also need it to destroy contaminants quickly enough to keep swimmers safe. In order to do both, you’ll have to strike a balance between appropriate free chlorine levels and CYA. To increase CYA levels, all you need to do is add some. Once you’ve added the proper amount, you won’t need to add it regularly because the chemical remains in your water at fairly consistent levels over time. Dilution is really the only thing that will result in lower levels, so be sure to test levels If you click this link and make a purchase, we earn a commission at no additional cost to you. after, say, a rainstorm. The World Health Organization recommends an upper limit of 100 parts per million (ppm) of cyanuric acid in a swimming pool. They arrived at this number based on the assumption that children will likely swallow some water while swimming, and if they ingest too much CYA, it can make them sick. We recommend keeping your cyanuric acid around 50 ppm. Aside from safety concerns, any higher concentration will inhibit your chlorine enough to chance algae and bacterial growth. Remember, more CYA doesn’t necessarily mean more protection from UV rays. If your pool’s cyanuric acid level is over 50 ppm, you may notice algae growth, some difficulty maintaining balanced chemistry, cloudy pool water, and decreased sanitizing. If your level climbs above 100 ppm, you may not even be able to read the exact amount on a test strip. In this case, take a sample in to a pool supply store for more accurate testing before you act to lower the CYA level. When you test your pool water If you click this link and make a purchase, we earn a commission at no additional cost to you. , if you find the CYA levels are too high, the first step is to troubleshoot. If you find this is the issue, switch to chlorine without CYA If you click this link and make a purchase, we earn a commission at no additional cost to you. added to it to prevent levels from rising again. However, you still need to lower the cyanuric acid level to keep your chlorine working as it should. If the CYA levels that are more than just a little high, diluting your pool water is the only way to lower them. Allow splashout to bring down your water level, then top off your pool with fresh water. If the levels are extremely high, you may need to drain and refill your pool. Be aware that the chemical can hang around in your filtration system, so if extremely high levels are a problem, you may want to backwash or change your filter. 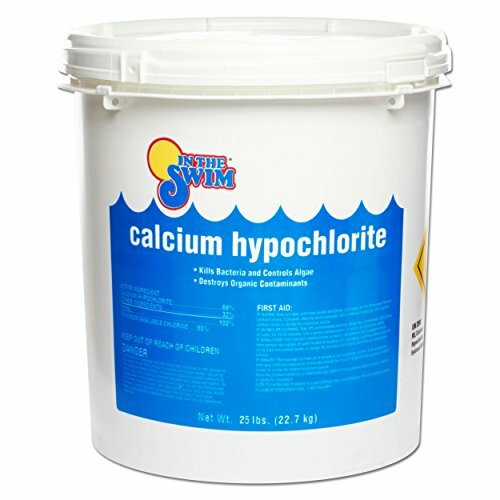 Cyanuric acid has also been found in pool plaster and in calcium scale. If your levels climb rapidly after a refill, lingering CYA could be the problem. You will also need to lower cyanuric acid levels if your pool is contaminated with cryptosporidium. Also referred to as crypto, this parasite can cause respiratory and gastrointestinal illness, and is typically introduced to pool water through feces. It’s a common problem in public pools and splash pads where babies go into the water with diapers not made for swimming or splashing activities. Crypto is resistant to normal chlorine levels, and contamination requires immediate intervention. The best way to eradicate crypto from your pool is to lower your CYA levels below 15 ppm, then hyperchlorinate your water. Backwash—better yet, replace—your filter so you won’t be flushing lingering crypto right back into your pool water. If you don’t measure the chemicals in your water frequently, it will be impossible to keep them properly balanced. 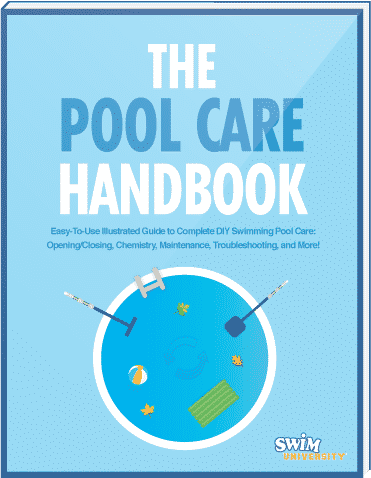 Understanding basic pool chemistry is the first step, but creating a pool maintenance schedule (and sticking to it) is crucial. Using test strips If you click this link and make a purchase, we earn a commission at no additional cost to you. to check your water chemistry every week is one of the simplest and most affordable ways to keep an eye on everything from pH, to free chlorine, to cyanuric acid levels. 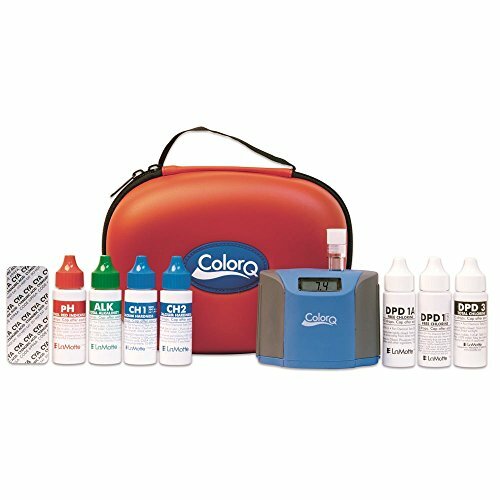 You can also use a liquid test kit or take a water sample to your local pool store. It’s smart to test your pool water weekly, at a minimum. If you’re keeping your water chemistry balanced and you don’t have a lot of rain, you shouldn’t see much change in your cyanuric acid levels. If you’re using dichlor or trichlor sanitizer (stabilized chlorine), you probably won’t need to add any extra CYA to your pool water. Whenever you add either of those sanitizers, you get a little boost of cyanuric acid right along with them. When using stabilized chlorine, you may notice cyanuric acid levels creeping up over time, and need to reduce the CYA. If you wish to avoid that problem, you can use chlorine that is not stabilized and add the CYA separately so you have a little more control over it. 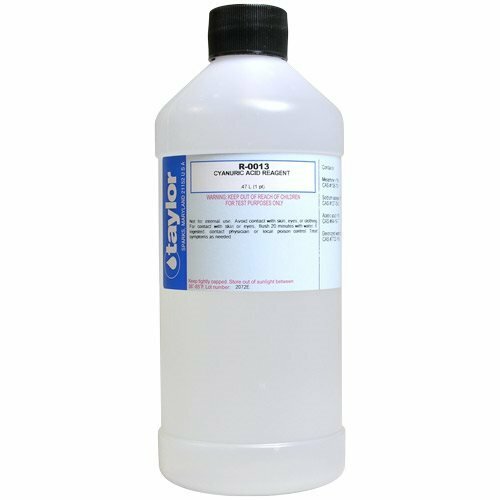 You’ll be happy to know that if you’re adding cyanuric acid If you click this link and make a purchase, we earn a commission at no additional cost to you. to your pool separately from your chlorine, you may only need to add it once or twice per year. Be aware that because CYA is an acid, it can cause damage to your filter and to your pool, especially if you have a vinyl liner. Even though some cyanuric acid product labels may instruct you to add it by pouring it straight into the pool or filter, don’t. We recommend a safer way. 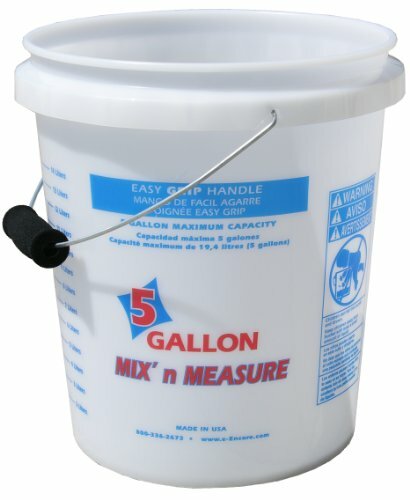 A 5-gallon bucket If you click this link and make a purchase, we earn a commission at no additional cost to you. Fill the bucket at least halfway with warm water. Put on your goggles and gloves. Add a dose of cyanuric acid to the bucket. Note:To establish 50 ppm, you’ll need to check the product instructions for your pool size. As a general rule, to gain 10 ppm of CYA in a 10,000 gallon pool, you’ll need to add 4.1 lbs of cyanuric acid. After pouring the chemical into the bucket of water, leave it to dissolve. It could take as little as ten minutes or as long as a few hours, depending on how much cyanuric acid you had to add. It’s okay if it takes a long while to dissolve in the bucket because it won’t be damaging your pool surfaces while it sits there. Once the cyanuric acid is fully dissolved, you can safely pour the contents of the bucket into your pool. Run your pool pump for at least a few hours after. Letting the pump run is like stirring the solution into your pool, just without having to use an enormous spoon. By now you know, “Should I use cyanuric acid in my pool?” isn’t really a question you need to ask. It’s definitely in your best interest to use moderate levels of CYA in your pool to maintain proper sanitizing without allowing the sun to eat up all your chlorine. While it does add an extra step to maintain your pool chemistry, it’s a worthwhile step both for your overall pool health, the health and safety of your swimmers, and your wallet.